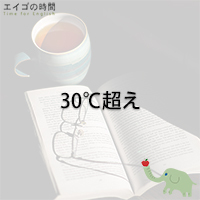 Home > ティータイム > 30℃超え – It’s already over 30 degrees. It’s already over 30 degrees. It’s about 20 degrees (Celsius). It’s 5 degrees below (zero).